Overnight steel cut oats are a great make-ahead breakfast idea for busy mornings. No Cooking required. 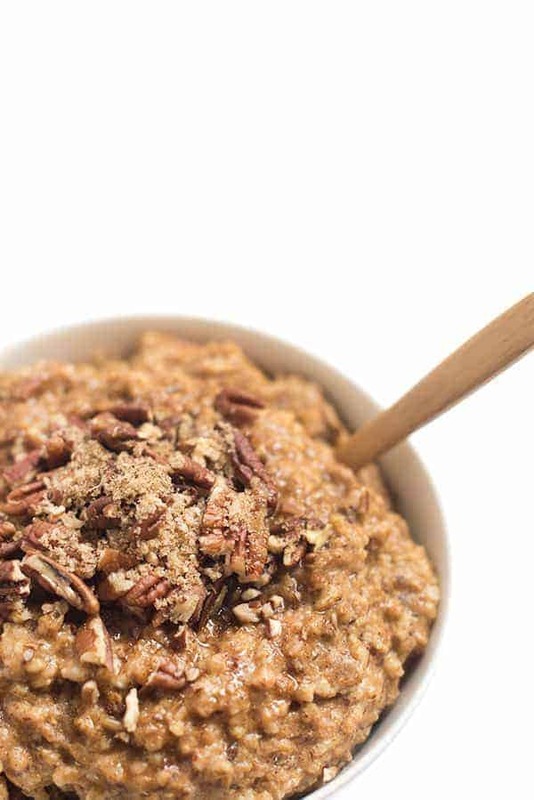 Steel cut oats typically require 15-20 minutes to cook. On leisurely weekend mornings, I enjoy this extra time to drink coffee and relax with my family while preparing any of these tasty variations: Coconut Triple Berry, Apples and Flax, or Blueberries and Walnuts. Busy weekdays? Not so much. Breakfast can be prepared on your schedule, any time of day. Don’t step foot in the door until 8PM? They can be made then. Baby naps at 1PM? That works, too. You get the drift. Endless topping possibilities help avoid boredom. The photo above shows banana slices, creamy natural peanut butter and local blueberries but that is just a suggestion. Here are a few others: almond butter, blackberries, cocoa powder, shredded coconut, strawberries, chopped pecans, pure pumpkin, raspberry preserves,… shall I go on? Overnight steel cut oats are a great make-ahead breakfast idea for busy mornings. Easy to make and healthy. No cooking required. 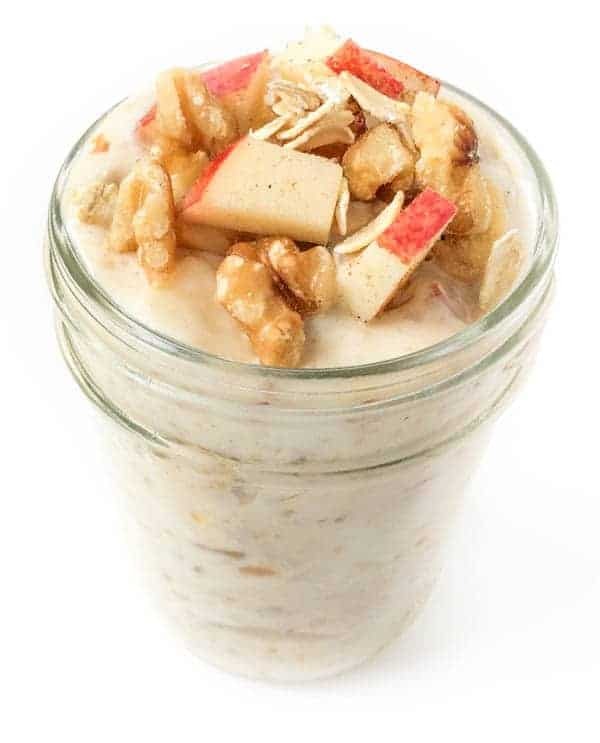 Combine oats, yogurt, milk, flax and pinch of salt in a glass jar and stir well. 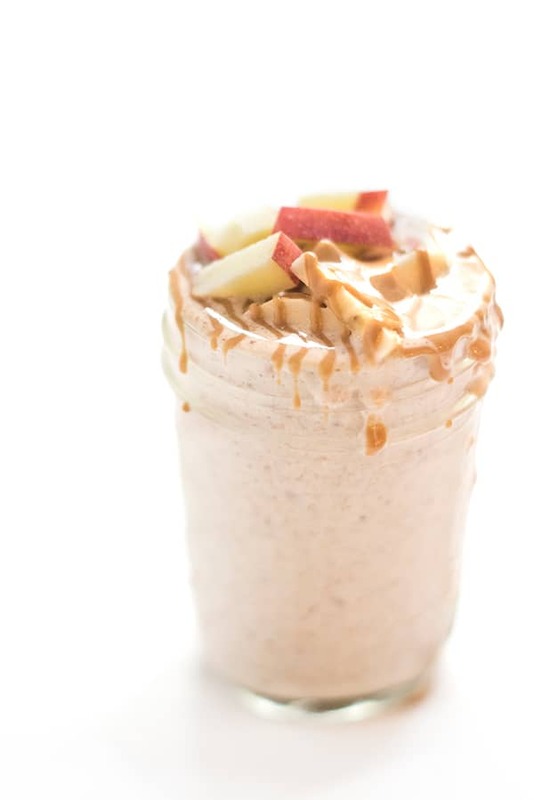 In the morning, stir in cinnamon, banana slices, peanut butter and berries. Steel cuts will have a nice chew to them but if you prefer to cook them further, add 1/4 c extra milk and microwave for 90 seconds. For all those that thought it was not softened enough, try leaving in the frig for 2-3 daus instead. I LOVE your recipe & creativity! My question is of rarity. I have Type 1 diabetes & because of this, I need to lower the carbs & sugar in this recipe. If I leave out the peanut butter & banana, will I totally destroy the flavor you created??? Do you have any other thoughts? Thanks! Peanut butter doesn’t have carbs does it? And my peanut butter has no sugar. Oats are, by nature, carbs but due to the high fiber content they are usually ok for Type 2. The banana is also natural sugar and also has fiber. 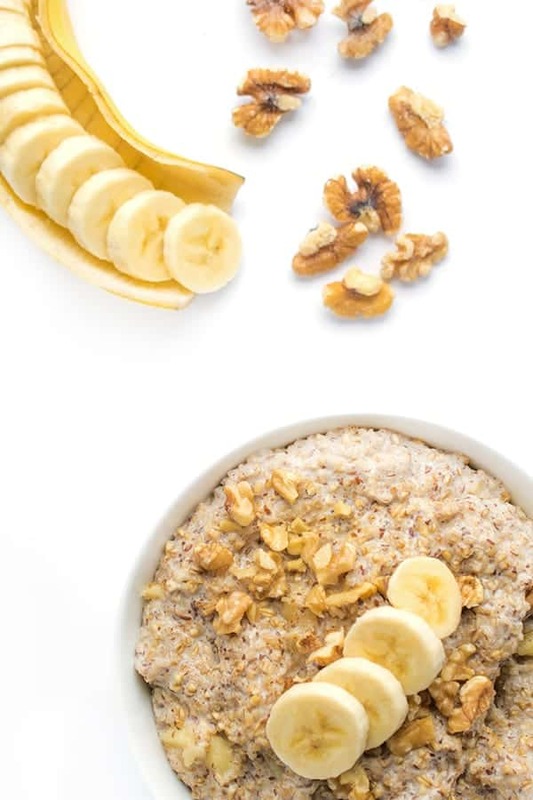 Can you ask your doctor about oats and bananas? Thank you, Liz, for the reply. Honestly, I never intended to leave the oatmeal out since it has such great health benefits!! I wanted to leave the peanut butter out cuz t don’t like it. As far as the banana is concerned, between that, the blueberries & the milk, there is enough glucose (whether lactose or fructose). It is too much glucose in one recipe for me. I would require too much insulin, as per my Type 1, not 2, diabetes regimen. I would prefer to eat the blueberries. I hope this helps. It would help if the nutritional analysis were available. I so appreciate your reply!! How many hours is ‘overnight’? Ours sat for 10 hours and turned out awful — basically slightly less hard than they would have been straight out of the package. Followed the instructions to a tee. Gonna try and salvage them by cooking, which sort of defeats the purpose of the recipe. Oh no! I’m so sorry to hear this Franky. Did you use the exact amount of liquids? To be clear, they will still be chewy and have a good amount of texture. If you want them to be mushier (or softer) simply add more liquid. Alternatively, you can always use old fashioned oats for a softer, less chewy consistency. So sorry these disappointed you! What if I don’t have any mason jars? Will regular Tupperware do? Absolutely!! Even a bowl would work – anything that can go in the fridge! Im not sure mine turned out right. How could it go wrong though?! I used Bobs Red Mill “quick cooking” steel cut oats and substituted Fage Greek Yogurt instead of regular yogurt. I tasted the base this morning before adding the rest of the ingredients and it tasted very mealy and flour-y. Like I was eating a high flour dough. After adding the rest of the ingredients I still wasnt that impressed and felt I needed to cover up the flour taste. It seemed more like an oatmeal smoothie than anything else. Hmmmmm….I was so hopeful! Hi Jill- I’m sorry these didn’t turn out for you! Have you tried making it as instructed with steel cut oats? I usually prefer using steel cut oats because they hold their texture and shape better overnight. Quick cooking oats take just minutes to make so they tend to turn to mush when soaked overnight. I hope that helps!! Please let me know if you ever try this with steel cut oats! 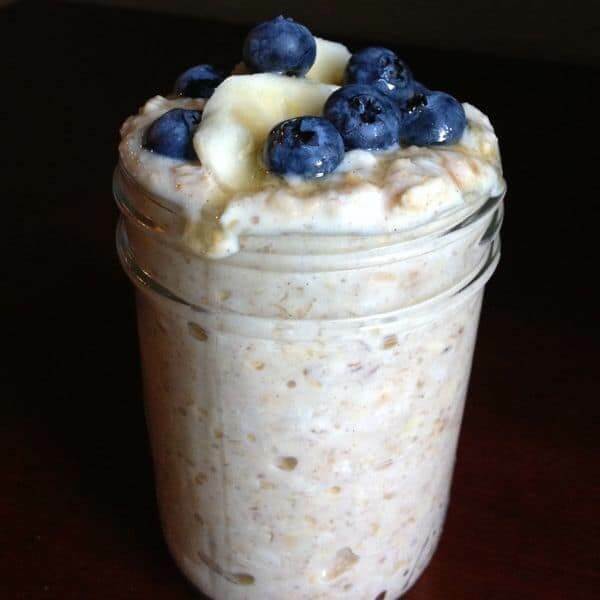 I LOVE overnight oats, but I’ve only made them with old fashioned oats. I wasn’t sure that steel cut oats could be soaked long enough to be eaten raw. Your recipe is not for 1/4 c cooked steel cut oats, I imagine. :) I’ll have to try this tomorrow! Awesome! I’ll be making these for tomorrow! quick question in which I’d like to ask if you do not mind. I was interested to know how you center yourself and clear your thoughts before writing. I have had difficulty clearing my thoughts in getting my ideas out there. I do take pleasure in writing however it just seems like the first 10 to 15 minutes tend to be wasted simply just trying to figure out how to begin. Any suggestions or tips? Thank you! Hi Kristine – I’m so glad you like my blog! For me the key to writing is simply to start writing. I’ll write whatever comes off top of mind and then go back and read it and change things around as needed. I often write posts a bit in advance and then I’ll go back to proof read before publishing and edit further. So, just write! And edit and write. :) Good luck! That recipe you shared looks great! This is definitely meant to have a good chew to it. If you prefer it to be less chewy, definitely stick with old fashioned oats as used in that Muesli recipe. I actually prefer the chew of steel cut but I like regular oats too! Thanks again for sharing that recipe. Has anybody tried adding any protein powder? Sometimes I have cooked oatmeal with protein powder and sunflower seeds. I never have because I usually throw in walnuts or chia but that is a brilliant idea!! Lovely recipe. Will this work with instant/rolled oats, you think? Absolutely!!! Works even better with quick cooking oats! This oatmeal caught my eye immediately – I love oatmeal, especially steel cut, but never make it due to its long cooking time. 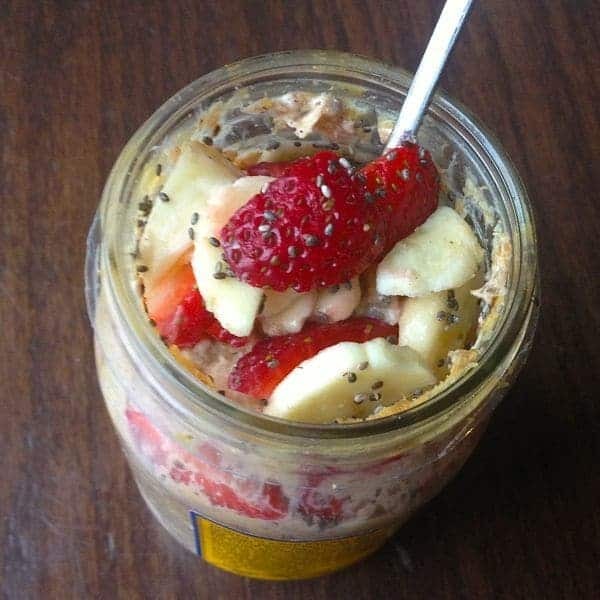 I’ve been making overnight chia pudding for breakfast lately, and will now start making your oats. Love the added yogurt, too. Brilliant! Thank you so much – I hope you enjoy it!! I know this is an older post but I had a question about it. Can it be made with any kind of yogurt? I’m thinking about trying it with vanilla greek yogurt…do you think it will still ‘cook’ the oats? Leslie I JUST did that last night! The greek yogurt was amazing. Have you ever had ben and jerry’s greek yogurt? The banana and peanut butter flavor? tastes really similar! It was delicious. Love the comparison to Ben and Jerry’s!! I’m so glad you enjoyed!! I haven’t seen that in my stores here. I’m in a rural area, but maybe we’ll get it one day. Thanks for the response! oh my goodness i think you have just revolutionized breakfasts in my house- thank you! my husband is a creature of habit and will eat all the cereal in the cupboards so fast, but this is a great alternative. and it’s so much healthier. just wondering, do you think i could make a bunch at the beginning of the week? or is it better to make just the night before? So great to hear!! I would think they would be fine made in advance but truthfully I don’t know for sure since I always eat them the next morning! Will you let me know?? You have wonderful and delicious ideas. The oats don’t have to be cooked at all??? No cooking required- isn’t that awesome? They soak overnight and turn out chewy and tender! Love that I can just have this in the morning! I hate making breakfast before I go to work – there just isn’t enough time! Isn’t it the best?? Let me know what you think! I tried this for the first time and it was delicious. I’ve been making this every day this week, but switching it up a bit. Thank you so much! I love realizing that I don’t have to make breakfast when I wake up! haha – me too!!!! Especially with a one year old who needs my attention. Enjoy! !